I'm in the process of developing my own application 'stack' (generic application slices with reusable cross-cutting concerns - e.g. Security, Configuration, and Logging). I have most of it in place at the moment, but still need to work out how I will secure my API's. Presently, I am looking at IdentityServer as a possible solution for this. I have lots of little ideas that I want to be able to push out and host as an Azure AppService. One of them is a Garden Maintenance Planning application, another one is a Habit Kicker service. The Habit Kicker application let's you create a habit that you want to kick - in my case, I am aiming to have alcohol free days (AFD's) and then record success outcomes. The system will push out an alert asking for feedback about whether you have achieved your goal for the day. For these types of micro-applications, it would be desirable to have a consistent, repeatable recipe for build/package/release that would scale across the different application types - e.g. Typescript client, DNX Web application, ASP.NET 4.6. Being able to create the infrastructure components and deployment pipeline rapidly, means that you can focus on developing value from as early in Sprint 1 as possible. In terms of infrastructure, my plan is to use Visual Studio Team Services for source code hosting, and for Build/Package/Release. Using Azure AppServices as my hosting platform provides me with a high level of control and flexibility. Azure AppServices also have useful platform components such as WebJobs that I can take advantage of. Please feel free to leave any tips or comments to let me know how you achieve rapid deployment for your little ideas. The default Nuget settings are a global configuration (%AppData%\NuGet\NuGet.config). How do different developers keep their Nuget package source configurations in sync if they are not in source control? The default package source folder is a global setting (%userprofile%\.dnx\packages). How can you run separate projects against a different .NET Core package versions without getting version conflicts for packages? aspnetvolatiledev – Any package that compiles is pushed here. Only used by contributors dealing with breaking changes between repos. aspnetcidev – A coherent set of packages that compiled referencing eachother. Used by contributors when building under normal circumstances. aspnetvnext – A coherent set of signed packages that have passed automated testing. Used by consumers evaluating the latest developments in the stack. Nuget.org – Official releases used by general consumers. The choice will depend on your appetite for risk/change/stability. Choosing the Nuget.org release means that your packages will be very stable for a long period (e.g. Beta 5, Beta 6, RC1, RC2, etc.) but you will have a lot of catching up to do when new packages are released due to the high amount of code and API churn that is happening at the moment. In choosing the ASPNETCIDev feed you will avoid monolithic refactors but, instead, you will get hit with regular breaking changes that will impact your development productivity on a daily basis. The vNext feed sits between the official feed and the CIDev feed and provides a trade-off between daily breaking changes or a monolithic set of changes. .NET Core projects define their dependencies in global.json and project.json files. Global.json identifies the platform version dependency while project.json specifies individual package dependencies. After you have configured these files in your project, it is simply a matter of running the dotnet CLI tool to restore packages from the feed source to your local machine. The dotnet restore command uses Nuget configuration to identify which feeds to use when restoring. The user profile defaults for Nuget are located at %AppData%\NuGet\NuGet.config. These defaults are updated when you manage package sources via the Nuget configuration tool in Visual Studio. Developers should have the best F5 experience possible - which means they should be able to checkout source code and run it without any friction. Thankfully we can enable this by configuring settings on a per-project basis. The dotnet restore command will look for and load a local project Nuget configuration before it loads the global configuration from the user profile. Similarly, command will look for a packages setting in the global.json solution configuration to identify where to locate restored packages before defaulting to %userprofile%\.dnx\packages. The following files explain my personal configuration for local projects to achieve projects that are self-describing of their dependencies and which assist with reducing developer friction. The first task is to create a local Nuget.config in the root folder of your solution. The first line of the Nuget.config clears any package sources that might be configured at another level - e.g. the global user setting. This ensures that the local Nuget.config, defines all sources that are relevant for the project and that these are checked in to version control with the rest of the source code. Next step is to configure a separate location for packages that are restored for the project. This ensures that the project is not impacted by other packages that might exist in the global package store which might have come from a feed which is running at a different cadence to the local project. At this point, running the dotnet restore command will restore all dependency packages from the vNext feed into a local packages folder in the root folder of the solution. The final step is to configure Git so that the packages folder is excluded from version control. This is simply a matter of adding a line to the local .gitignore file for the solution. Earlier this year, after attending a Microsoft conference, I blogged how the momentum of the developer workflow is moving rapidly towards running tasks from the command line. Since then I have continued to develop skills and knowledge in this area. A straightforward step. You could open Windows Explorer and browse to your root working location and create a new folder. However, as we are going to be working inside of the command shell, we can avoid the friction of opening Explorer by running DOS commands. NOTE: Since moving to the command line for my workflow, I have leaned more and more on ConEmu as my tool of choice for running command line tasks as it is only ever a keystroke away. That gets me a new project folder named myproject in my development working folder and places the location of my command prompt in the new folder. Running these commands creates a package.json folder that contains the node configuration information. It also creates a node_modules folder where the packages that get downloaded are stored. NOTE: Later the node_modules folder is excluded from source control as the packages can be pulled down on demand using the npm install command - typically either on the build server or on another developer machine. Note: This assumes that you have VS Code installed on your machine and that it is configured on your PATH variable. browser-sync start --server --port 3001 --index default.html --files="./*"
This command launches the app using a web server. Browser Sync is a node package that was installed in the tooling step. It watches files for changes and then refreshes the browser to show the updates. Update the package.json file by configuring the start command to launch the website using the command that was just created. NOTE: All of these tasks can be automated using VS Code's task runner but I am not yet as familiar with that task runner as I am with the approach shown in this article. Typescript projects require a tsconfig file that defines compiler settings and identifies the Typescript files to be compiled. Create a file named tsconfig.json in the root of the folder and add the following configuration information. As the project is developed, files get added to the files element and further compilation options added as necessary. The project will need a suitable default html file and this is the basic template that I have been using. At this point you should be able to press CTRL+SHIFT+B and see that the project builds - later when you have Typescript files, you will see that they get built into the js folder which is what we configured in the compilation options earlier. You should also be able to run npm start and see the default page load up in a browser. If that has worked so far... well done! With all of that hard work, the last thing you want is to lose content that has been created. The final step is to configure Git and commit the project to source control. 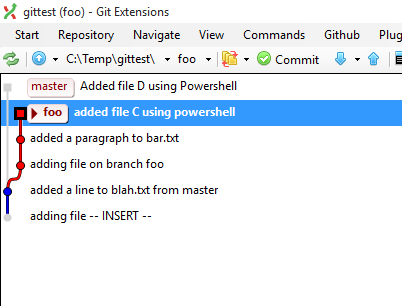 To start with, create a Git ignore file to exclude Typescript generated content, and packages. The file should be named .gitignore and contain the following definition. NOTE: Read Scott Hanselman's article to learn how to create files that start with a dot in Windows. Today I decided to look into working with Json in Powershell. Json is rapidly overtaking Xml as the preferred format for describing projects and build artifacts, so it makes sense to learn how to integrate it with tools such as AppVeyor scripts, Visual Studio Team Services Build Tasks or Octopus deployment steps. $obj.Age = 45     # I always lie about my age! The ISE amazed me in how it was able to infer the schema of the $obj instance and provided me with Intellisense after that! Running that script updated the value of the Age property and saved it back to the file. Here, the result variable refers to a Parent type which will have a collection of Children which will have a Parent ... oh never-mind, I'm sure you see where this ends! When building a Web API application, we might think of exposing this type of query through a Controller action. In such a case, how should the serializer deal with the cascading references. One solution is to use a Serialization solution such as the ReferenceLoopHandler that is found in the Json.Net library to ignore circular references. This switch tells the serializer to exclude reference properties after they have been found the first time. Another solution is to shape the data to return specific fields from the service operation. This approach helps to control the shape of the data and to have greater certainty over what is being returned. Taking this one step further we would create custom Data Contract classes and return those instead of the loosey-goosey approach of returning anonymous types. This approach gives us better static checks across the application, allows for reuse of Data Contracts across separate operations, and allows us to see where different contracts are being used. From a versioning and maintenance point of view, this would be the gold standard. What is your approach to designing service endpoints? Do you mix RESTful with RPC-style design all in the same Controllers or do you separate them out into their own classes of service? From the command line, open the new project using an Editor of your choice > code . As you can see, much more is being done from the command line. New tools such as cmder are being used to gain quick access to command windows for Powershell/Node/etc to assist and speed up this flow. Cmder is great because it has transparency, allows you to have multiple tabs, and is easily summoned and hidden away using CTRL+`. For my task today I decided to initialize a Git repository, add a file, make changes to the file, and commit those files to a Git branch all from the command line. 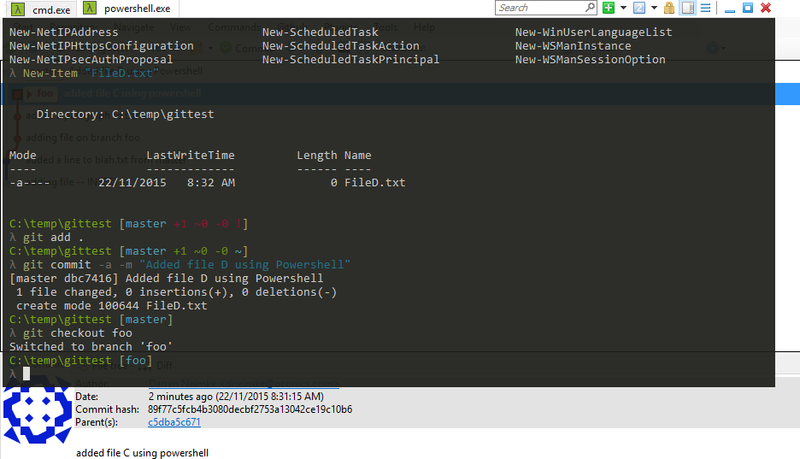 I wanted to use Powershell to create the project folder and the initial file so that I could tick my "One thing per day" goal of using PS for something at least once per day! I found the New-Item (alias: ni) cmdlet which allows you to create a variety of item types. To create a new folder, give it the -ItemType of 'directory' and then the name of the folder that you wish to create. E.g. This adds a new file named file1.txt and opens it in Notepad. > git commit -a -m "Adding file1.txt"